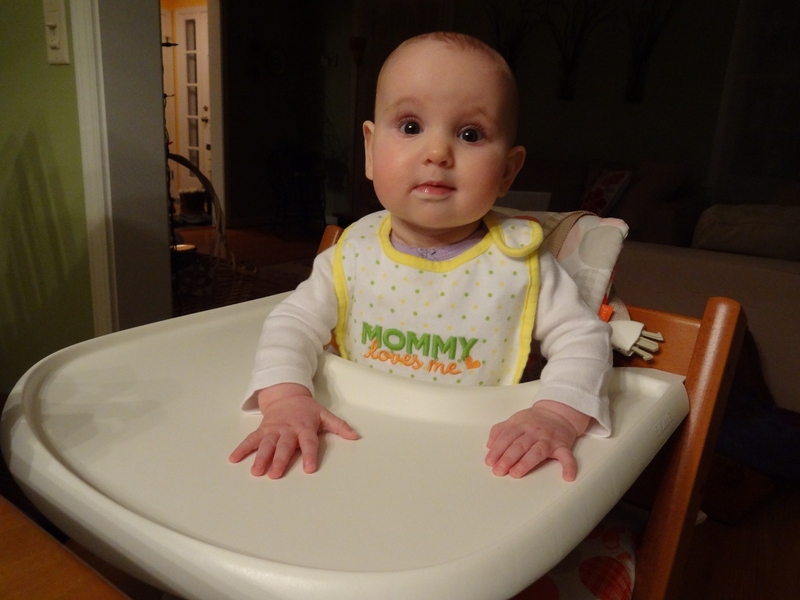 The time has come… Julia is old enough to eat solid foods! It is amazing to me that she is at this stage already. It has come so fast. I was prepared… my friend Marc gave us the Baby Gourmet (Les Petits Plats Français) cookbook and as a birthday present, Joel’s mom gave me the 201 Organic Baby Purées cookbook. Both books are great! Both contain lots of recipes for first as well as upcoming feeding stages. The 201 Organic Baby Purées book even contains a menu to use as ideas for what you can feed your baby. I was excited to start cooking for her. 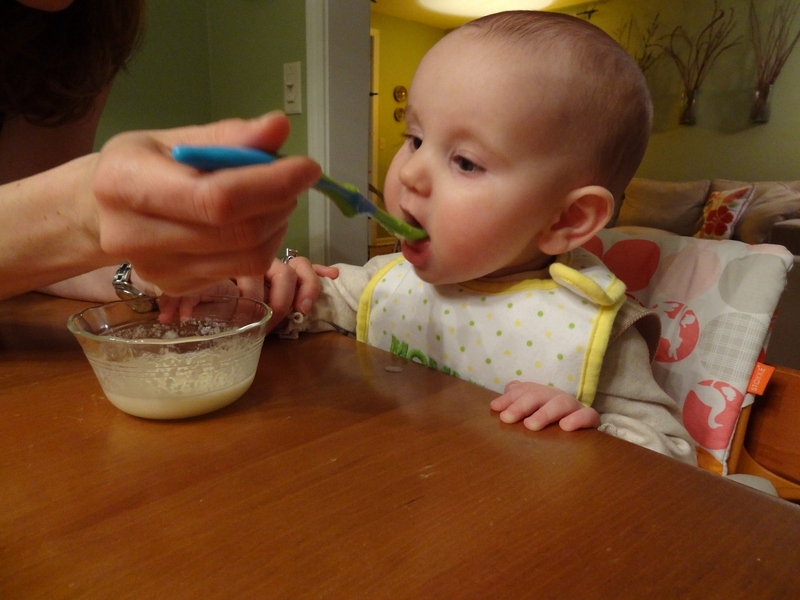 Julia’s first solid food… rice cereal. 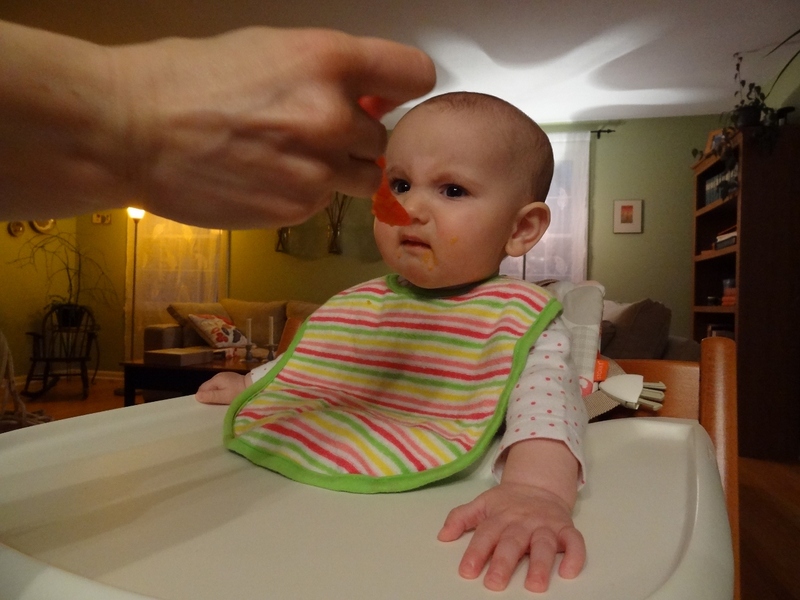 As a first feeding, we gave her rice cereal. I was amazed! 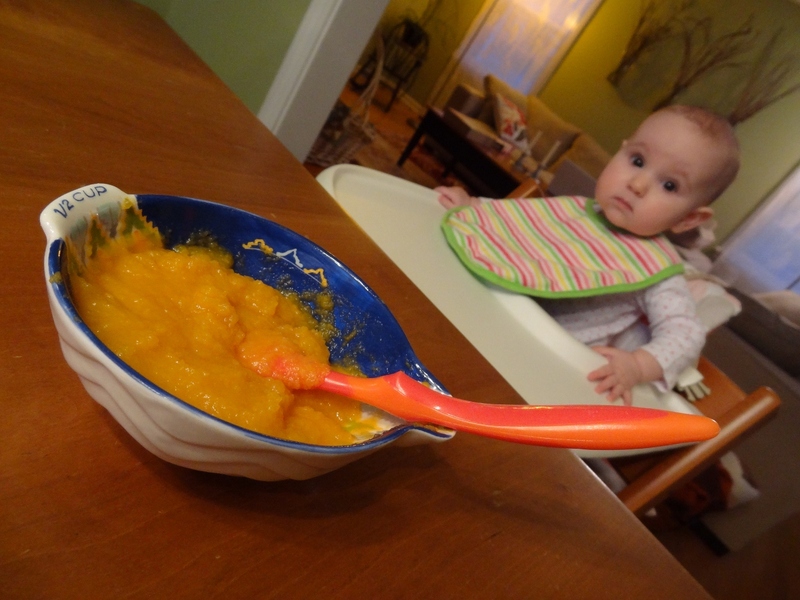 She knew exactly what do to with the spoon… she opened her mouth wide and took the spoon just like an adult. Crazy! She was very enthusiastic about it and she loved the cereal more and more everyday. Oatmeal cereal approved but not as enthusiastic as the rice cereal. 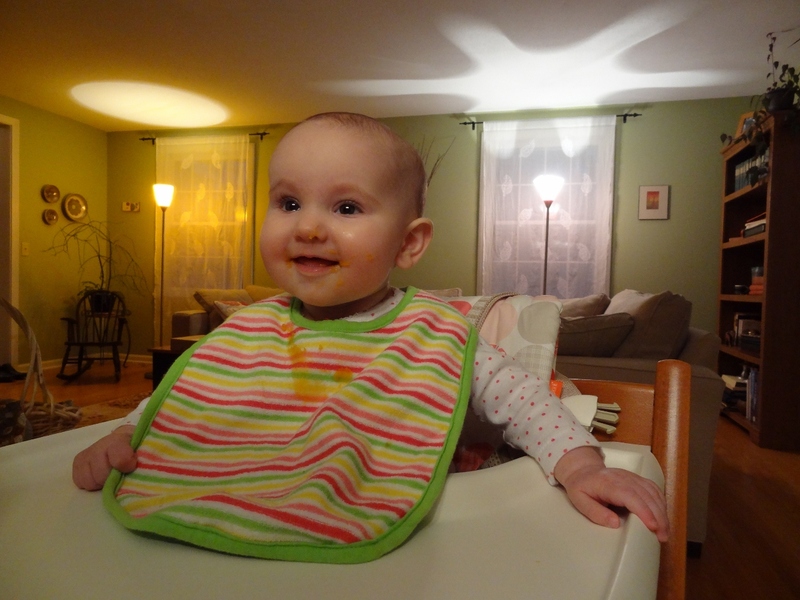 Then last weekend, we started feeding her oatmeal cereal. She was not sure how she felt about it at first. She was not as enthusiastic as she was when we fed her the rice cereal. After a few days though, she has grown to love it. Since we were done with the cereal options, I decided to move on to vegetables. 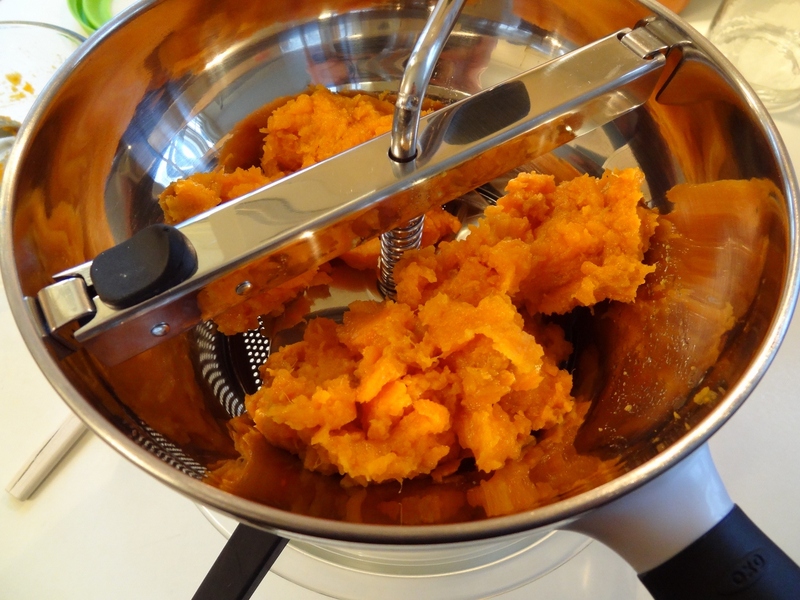 So last weekend I prepared her newest dish… sweet potatoes! I was so excited to feed it to her. Uh… what is that orange stuff? Julia, on the other hand, was not as excited as I was. Her reaction was priceless! Bah! I don’t know about this orange stuff! The funniest part about it was that she was willing to eat it and was excited, but at the same time she was not sure how she felt about it. We fed her the sweet potatoes for a few days and she liked them more and more everyday. Next up are avocados and carrots. (!!) 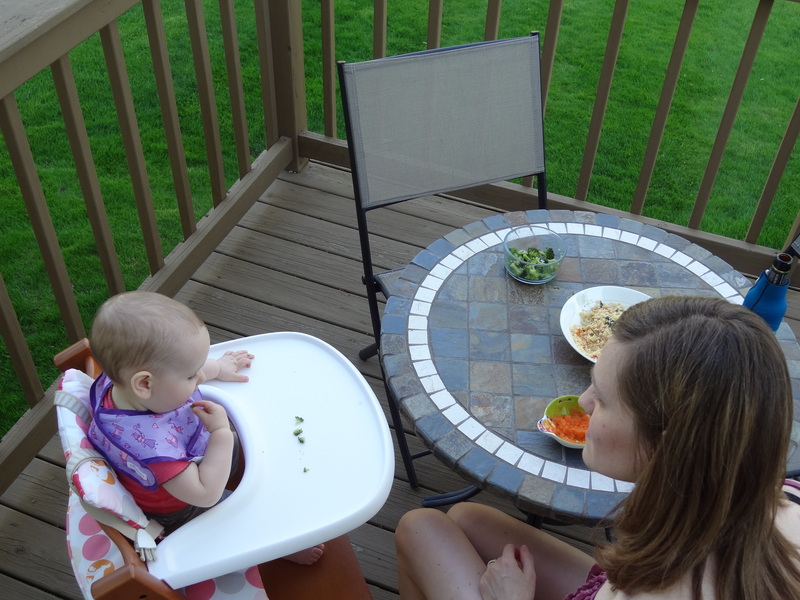 I look forward to her reactions to the tastes and textures as we cycle through the many varieties of vegetables and fruits. I have embarked on a new adventure: pregnancy. (!!!) After being on the fence for about 7 or 8 years, Joel and I finally decided to have a baby. 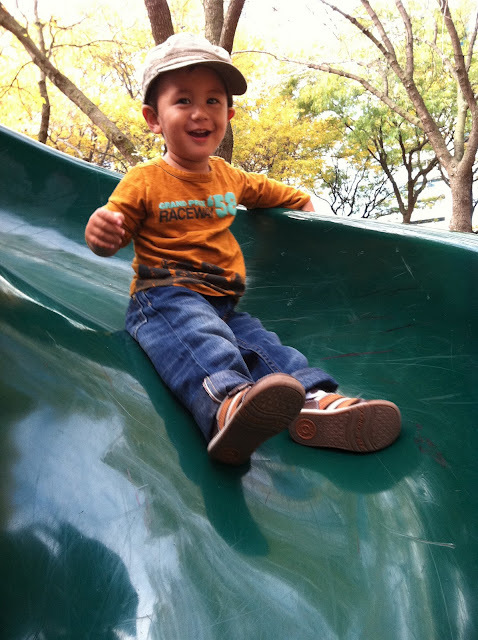 My nephew played a huge part in our decision. We had a few opportunities to spend time with him over the past year: 10 days in St John in February, 5 days in Chicago in October, and another 7 days in the beginning of November here in Rochester. As soon as my brother and Jack left Rochester, Joel and I looked at each other and we immediately knew that we were ready. 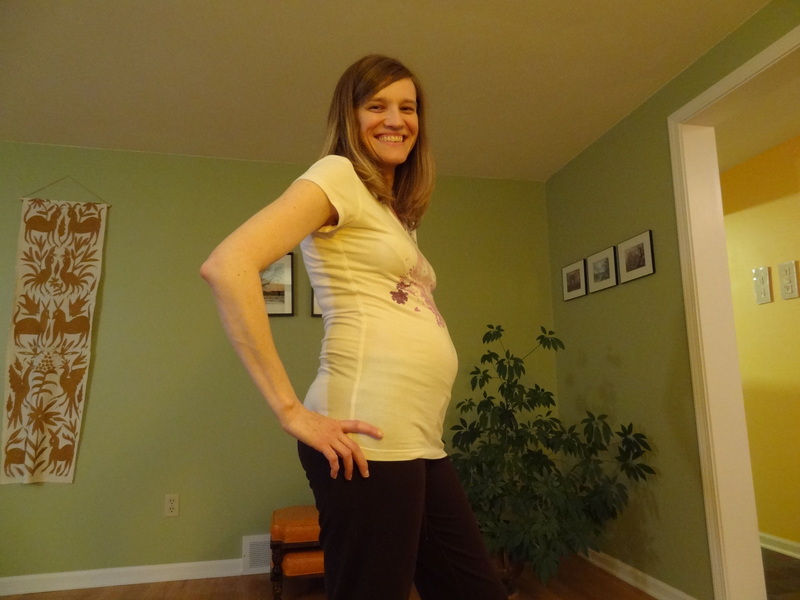 A few weeks later, I found myself in Wegmans shopping for a pregnancy test. 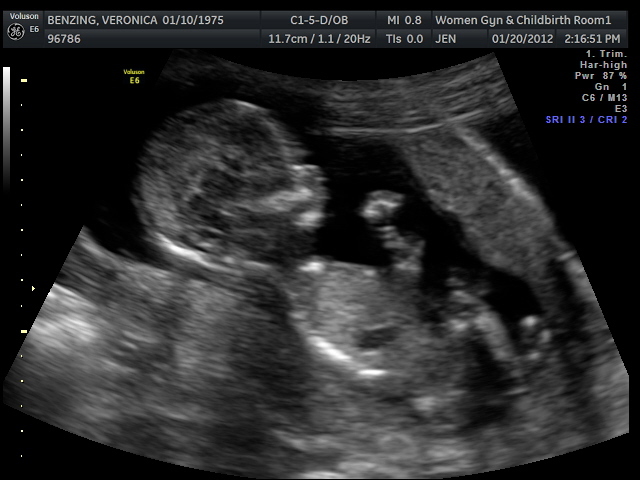 I knew that I was pregnant (so much for it taking up to a year to happen per my doctor’s comment… HA!). Apparently all the planets aligned and it was the right time. I was ready in every possible way. My pregnancy has not been too bad so far. I did not experience any morning sickness, which I feel very lucky about. One thing that I have had is food aversions, which has been making my culinary experience a bit challenging. I am unable to eat any meat, since it smells and tastes horribly. I realized this as I was feeding my kitty his chicken in gravy dinner. His food smelled appalling. Then that same evening, I cooked some chicken. Just disgusting! I am pretty bummed by this since I can no longer eat Bánh Mì sandwiches. Another thing that I cannot eat is green peppers. Joel and I met for lunch at Chipotle one day and I ordered my usual: two tacos with brown rice, sautéed green peppers and onions, corn salsa, guacamole, and lettuce. I took one bite of my taco and my entire lunch was ruined. I have not had peppers since. The same happened with nuts (walnuts, cashews, pecans, and almonds). Just no good! Luckily pistachios and pumpkin seeds still tasted ok, since the Matchstick Pasta recipe is on my dinner list pretty frequently and my favorite cereal contains pumpkin seeds. I tasted an almond two weeks ago and it actually tasted good, so I have been snacking on a few lately. Cooking onions and garlic is also appalling, which is not good since most dishes require these two cooking staples. The last thing that really bummed me was the aversion to chocolate. Just sad!! I really hope that this changes soon, because I really miss chocolate. Aside from all these aversions, food still does taste good. Especially Bosc pears, clementines, avocados, blueberries, Pirates Booty Veggie snacks, fish, and salad just to name a few things. So my culinary experience is not completely in ruins. My belly at 14 weeks. The last thing that I would like to mention is my growing belly. I frequently find myself rubbing it and talking to the baby. Don’t get me wrong… I have my moments. Sometimes when I look in the mirror it looks like I’ve just eaten 10,000 donuts. But then I remember that it is not true and I feel better. Also, the fact that I have a baby growing in my belly is just mind-blowing! I still cannot believe it. I have experienced a few strange but also amazing things during the past 14 weeks. For example, I knew right away that I was pregnant. I cannot explain the feeling that I had… I just knew. Also, slouching is not too comfortable since I can feel this thing pushing up towards my ribs. I have been told that it will get even worse once the baby gets bigger. Same goes with leaning forward. My bathroom mirror is fairly far from the sink so I have to lean forward to look into it. Whenever I do that, I can feel this ball like thing falling forward towards the front of my belly. So strange! And when I try sucking my stomach in, nothing happens. HA! I look forward to the future experiences that this new adventure will bring. I am sure that there will be many.